Wouldn't it be great if every day was your birthday? Miss Nina & The Jumping Jacks new album - Every Day's Your Birthday! - celebrates just that! Indie music for kids is really popular and this album captures that indie-electric-pop perfectly! Featuring familiar songs like - Wheels On The Bus and Five Little Pumpkins this album has a lot of pep! Then it slows down with a bit of a twangy country feel in Let's Go Home (one of my favs!) DJ in my PJs is a fun upbeat bedtime song perfect for burning off that last bit of energy with your little before tucking them in! Lastly, I have to mention the title track - Every Day's Your Birthday! - which celebrates that the day is what you make it so make it a positive one! You determine your day's worth good or bad. Love this lesson!!! Every Day's Your Birthday can credit its own nativity to the concept that no matter what day it is or what life brings, within us all is the power to change our attitude. Says Nina Stone, "The best way I know how to do that is with music and movement. A little dance break can brighten your outlook and the trajectory of your whole day! Why not make every day a great day?" Musically, Every Day's Your Birthday traces its roots to '60s and '70s pop and rock music -- from The Brady Bunch and The Beatles to Led Zeppelin and the Grateful Dead -- and also displays Miss Nina's love for dance and early '80s hip hop and rap. Every Day's Your Birthday will be available on iTunes, CDBaby, Amazon, and mymissnina.com. Visit the Miss Nina's website HERE. 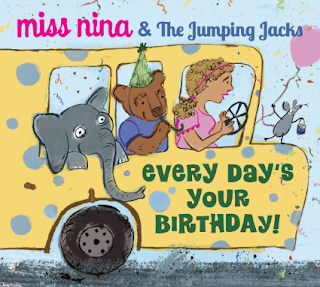 One lucky reader will win a copy Miss Nina & The Jumping Jacks - Every Day's Your Birthday! My favorite line would probably be "The wheels on the bus go round and round." I sing this everyday to my son "The wheels on the bus go round and round round and round, round and round..."